Dr. Bundalo is a "pain-free" dentist serving the greater Phoenix area, and whether you need dentures, veneers, teeth whitening or a simple checkup & cleaning, we utilize the latest dental technology to better serve you. And remember, we offer free consultations and second opinions for all new patients! New patient? Download & fill out required forms. We offer free second opinions and free consultations! Our goal is to provide the most comfortable experience possible for our patients in Phoenix. By utilizing the latest dental technology, we can reduce pain and improve recovery time for every procedure we offer! 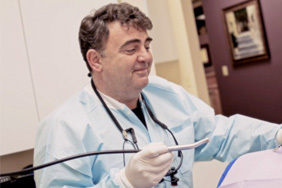 With so many dentists in Phoenix, why choose LB Dental? We give free second opinions, so you never have to worry about spending too much on the wrong procedure, whether your need veneers, dentures, crowns and bridges or something else. Our use of BIOLASE lasers results in pain-free procedures and shorter healing times. We provide comprehensive and innovative dental care, so you know your treatment will be done with the most up-to-date technology and methods. Dr. Bundalo is experienced in treating clenching, grinding and other issues of the jaw. We accept most major forms of dental insurance. You may have TMD (temporomandibular disorder), which is often caused by grinding, clenching, stress or dislocation of the jaw. LB Dental is equipped to treat issues with the masticatory system, including clenching, grinding and muscle/jaw pain. For many patients, an occlusal (bite) adjustment can result in lasting relief from pain and other symptoms.